Swyft Filings: Is this the Right Incorporation Service for You? and, they get overwhelmed just thinking about all of the steps they have to take! Don’t let that be you. If you’re overwhelmed thinking about incorporating your business, consider a legal service like Swyft Filings, who will help you navigate everything you need to do to be legally and financially compliant while starting a business. 2 How Does Swyft Filings Work? 3 How Do I Get Started with Swyft Filings? 4 Who is Swyft Filings For? They offer small business the peace of mind knowing their legal documents required to start their businesses have been filed correctly, and the requirements to maintain ongoing compliance are not forgotten. LEARN MORE ABOUT SWYFT FILINGS SERVICES HERE. How Does Swyft Filings Work? It’s typical for entrepreneurs to come up with their business ideas, then to get swamped with the reality of all of the legal and accounting requirements of making the idea a reality. Swyft Filings helps to minimize the overload by providing legal answers to incorporation questions, breaking things down in a structured and simple way, and coordinating with the legal offices so entrepreneurs don’t have to. How Do I Get Started with Swyft Filings? You can use their business structure wizard to decide which business structure is most appropriate for your business. TRY THE BUSINESS STRUCTURE WIZARD NOW. Once you’ve picked your business structure, you want to decide which state do you want your “headquarters” to be located in. Some entrepreneurs prefer the legal benefits of incorporating in a state that’s not where they live, and that choice is up to you. YOU CAN ASK QUESTIONS COMPARING STATE REQUIREMENTS IN THE LIVE CHAT. 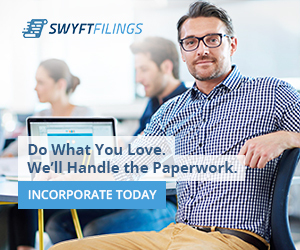 After the paperwork is complete, Swyft Filings will incorporate your business for you. Who is Swyft Filings For? Swyft Filings has a learning center where there are articles to help answer common questions about preparing to launch, starting a business, dissolving a business, and more. Swyft Filings offers live chat, phone, and email support to customers and potential customers. They offer a registered agent service that bills $149 annually, and it seems that many customers forgot they were signed up until billing. SwyftFilings may not notify them as much as they could to avoid the customers feelings of unauthorized charges. If you decide to use their registered agent service, make sure to ask for a reminder or set your own reminder. TrustPilot has 662 reviews of Swyft Filings and 85% are 5-star, 10% are 4-star, 2% are 3-star, 1% are 2-star, and 5% are 1-star. Sitejabber has 18,946 reviews with an average rating of 4.5 stars. It seems like the Swyft Filings customers are a HUGE crowd of satisfied people. There were quite a few reviews that spoke positively about Swyft Filings. In fact there were tens of thousands, however, I picked this review because it was very thorough and summarized many of the others. I decided to use Swyft FIlings to handle my new business paperwork and I am very glad that I did. I decided to use Swyft FIlings to handle my new business paperwork and I am very glad that I did. They make the process as simple as possible and walk you through everything. What really impressed me was that I could send my representative a question and would always receive an in-depth personal response. I highly recommend this service for anyone wanting to start filing paperwork to a business. Of the negative reviews, I think these two summarized the concerns of the people who were unhappy with Swyft Filings’ services. I used this company in 2017 to file my LLC but no longer have that business. All of a sudden out of the blue my acct was debited $149.00 with no advance warning or anything. I tried to get a refund and the woman says I am not entitled a refund. Don’t keep your credit card on file or they will do what they want with your money. So not cool. Next stop BBB and Attorney General! Your website says $344 for a complete package. I then got pages offering additional services I would need for additional cost. Other sites offered these up front and thought their total cost was higher, they at least stated the real costs out of the gate. Overall, Swyft Filings is a legitimate service provider that seems to be helpful to customers most of the time. They have some disgruntled customers because they probably could be more up front about payments that come out annually (such as the case for their registered agent service), and their upsell funnel seems to get a bit confusing for some. Even with the bad reviews, it still seems that majority of the customers have very positive reviews and even call service providers by name. With nearly 17,000 4 or 5 star reviews, it’s definitely a helpful service. If you choose to use Swyft Filings, make sure to set your own billing reminders, and don’t buy into the upsells and sales tactics without thoroughly understanding what you’re getting. If you’re ready to get started with Swyft Filings, for incorporation or other services BEGIN WORKING WITH SWYFT FILINGS HERE. Get Started with Swyft Filings Now! Hi Tiffany, I am back. lol In case I haven’t told you before, I think you have a very helpful website. I think my business is going to have an awesome year and that I’ll be making more money. So, I am seriously considering whether I should adopt a different business structure that protects my personal assets in the event that someone was to decide to sue my company. Unfortunately, instead of working, some people rather make money suing people and companies. Figuring out a simple way to do the legal paperwork has been my biggest obstacle in adopting a different structure. My greatest fear has been using forms that were not legally sufficient to accomplish my goal. So, thank you for this review. ps – I liked your recent post on the business cards. Even though I have been a huge fan of Vista Print, I checked at Zazzles business cards. I liked their designs so much that I plan to order some this week. Thanks! I’m so glad the reviews are helping you Sondra! That really makes my day. Hopefully, one of the companies I’ve recently reviewed can help you with your incorporation as well. Swyft Filings, Corpnet, and Rocket Lawyer are all good options if you want consultation as you’re going thru the process. Best wishes on a great year in your business! I predict one of them will. I will probably research it some more this weekend once I decide on which type of business structure that I want to use. Best wishes for a productive and profitable year for your business also. I’d love to hear what you decide! Best wishes for your year also! There are a lot of processes involved in starting up a business especially registering it. The incorporating and all is stress enough. This Swyft filings would go a long way to make company and business owners happy by reducing their stress and helping them with the legal documents for the company at a low cost. I agree. Thanks for sharing your opinion! Swyft Filings sounds like a great asset and tool for startups when it comes to legal issues! Although I’m not currently starting up a business, I do see it’s value and significance in today’s situation when it comes to the limited resources that start ups have. I must say, I do dislike websites and services that do insist on upselling, especially when there already is a payment involved initially. I don’t like high pressure sales, but I don’t mind upsells when they’re done well. When you think about it, companies like McDonald’s upsell all the time, and most people don’t complain. You order a burger and they say, “would you like a fry and a drink with that?”. Sometimes, upsells can be helpful, but when they make the process confusing or make you feel like you’re being taken advantage of, then it’s not good. Hi Tiffany,WOW, excellent review, I really loved the reading! My husband is starting a business soon, and the one thing that scares him is the paperwork, tax, and all those stuff. So I was looking for a company that could do the job well. I see that Swyft Filing has good rating apart from the billing problem and the aggressive pre-sell. These don’t bother me at all as long as I know what to expect.Anyway, I’ll show this article to my husband; I am sure he will find it interesting. Just a question, please. What if something goes wrong with the paperwork? Does the Swyft Filing company take responsibility for it?Thank you! Great question Daniela! Swyft Filings actually has a great money back guarantee. They say that if you’re not completely satisfied, they’ll give you your money back, and if they make an error, they’ll fix it at no additional cost to you. Copyright © 2019 How To Entrepreneur | Powered by KOHA Inc.